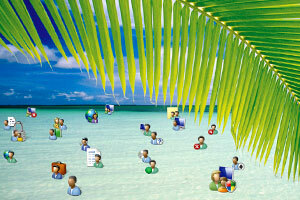 All residents of Windows Vista have gone for a swim, trying to rest on their hard-earned holidays. Unforunately on the flight back home their plane crashed and again they have to swim. Prints on Plastic, 100 by 75 cm, shown at Galerie 35 in Berlin in combination with Aqua III, Super Dock Clouds, Prints on Canvas, Mac and Windows Edition, Aero: User Romance and Aero: Home Security. See the photos of the show at Flickr.